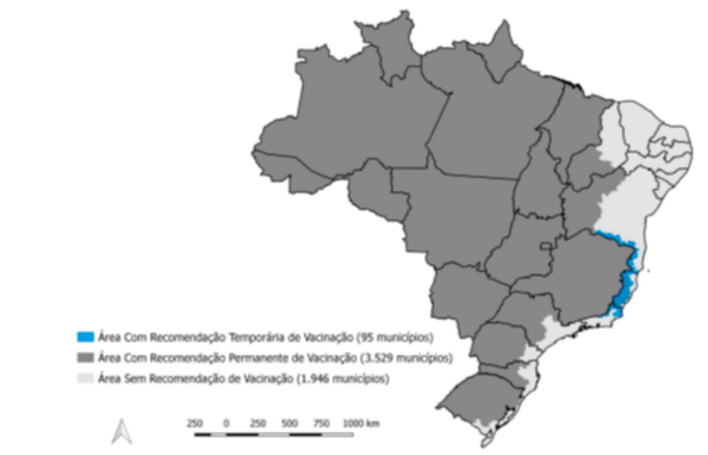 In our continuous look at the yellow fever outbreak in Brazil, the Brazilian Ministry of Health, or Ministério da Saúde (computer translated) now puts the confirmed yellow fever death toll at 89. Through Friday, 263 cases of the disease have been confirmed (Minas Gerais-225, Espírito Santo-34 and São Paulo-4). In all, 1,258 suspected cases were reported, of which 882 remained under investigation and 113 were discarded. Concerning yellow fever related fatalities, of the 200 reported deaths, 89 were confirmed, 108 are still under investigation and 3 were discarded. Eighty-six percent of the confirmed deaths were reported in Minas Gerais (77). The states of Minas Gerais, Espírito Santo, São Paulo, Bahia, Tocantins and Rio Grande do Norte continue with cases under investigation and / or confirmed. Since the beginning of this year, the Ministry of Health has sent extra doses of the yellow fever vaccine to states that are registering suspected cases of the disease, as well as others located in the border with areas that have reported cases. In total, 12.7 million extra doses were sent to five states: Minas Gerais (5.5 million), São Paulo (2.75 million), Espírito Santo (2.5 million), Rio de Janeiro (1.05 million) Million) and Bahia (900 thousand).